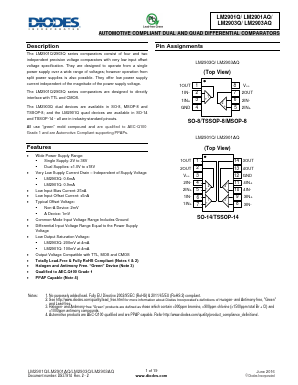 The LM2901Q/2903Q series comparators consist of four and two independent precision voltage comparators with very low input offset voltage specification. They are designed to operate from a single power supply over a wide range of voltages; however operation from split power supplies is also possible. They offer low power supply current independent of the magnitude of the power supply voltage.